Le Tournoi de Chauvency, written c. 1285 by the French poet Jacques Bretel, narrates a courtly celebration in Lorraine, and is the inspiration for Anne Azéma’s musical theater piece “The Night’s Tale,” to be presented by the Boston Camerata and the Longy School of Music at Pickman hall, Cambridge, April 16th-17th. The poem, and this performance, evokes a day’s festivities at the chateau of Chauvency. Daylight is the domain of men, who joust and fight in ritual encounter; when night falls, women converse in music and dance, far from the masculine violence of the daytime. Mutual desire aroused during the day culminates in the evening’s rites — aggressive and courtly, passionate and playful. These Cambridge performances have their roots in Europe, and are the fruit of a residency for me and for the Aziman Ensemble at the Arsenal of Metz, France. The piece is centered on a rare and important manuscript from the region. “The Night’s Tale,” was first created in 2007 in Metz, a co-production of several institutions: L’Arsenal, Le Couvent, K617, Fondation Banque BNPParibas, France Telecom, Le Grand Théatre Luxembourg, the Festival of Bar le Duc, and others. This 2016 production is the result in part of a collaboration between Boston Camerata and the Longy School of Music of Bard College, which hosted a graduate seminar, led by Anne Azéma, on the manuscript of Le Tournoi de Chauvency and its relationship to medieval courtly love. Why the focus on the Tournoi de Chauvency? The first reason is the intrinsic interest of the manuscript—Oxford Bodleian, Douce 308—that contains the Tournoi. It is an important source for the understanding of medieval society from many points of view—literary, historical, visual, aesthetic, and musical. It reveals much about love relationships and their social context. The Tournoi text, a rhymed narrative of over 4000 lines, relates with verve and relish a weeklong program of combats and jousts, and the amorous exchanges of a privileged, youthful European crowd. Within this narrative are to be found the keys to a vastly important code of behavior, what we now call the system of Courtly Love. It is a system or code that signifies something new in feudal society: the possibility of a love relationship between equal partners. 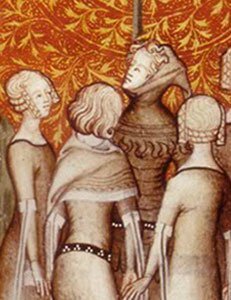 Unlike the more rigid and tribal view of marriage so widespread in medieval society, in this ethos one partner or the other is free to accept or refuse the suit of the other. The tournament or ritual combat—whether physical or metaphorical—is, within the Courtly Love framework, one of the steps which can lead the two partners to the plenitude of shared love. “Love makes one heart from two,” says Jacques Bretel, author of the Tournoi de Chauvency. The response, the Gift, freely offered, permitting a union in Love. These steps correspond, approximately, to the chapters of our program. There are constants in human nature. Our own society, rightly preoccupied with increasing the chances for equality in so many domains, can take inspiration from this audacious-for-its-time medieval experiment, its blend of old and new insights into a universal quest. Yet another reason for our interest in the Tournoi is its vivid evocation of music, dance, and festivity. For all that, the manuscript contains not a single scrap of notated music. To make our project function in the here and now, the source itself urges us on. It obliges us, performers already familiar with many dimensions of medieval music, to push our inquiries still further, to create something new based on the skills we have already acquired in more familiar, less enigmatic contexts. Important among these is the practice, widespread already in the Middle Ages, of adapting or « twinning » new texts to already existing medieval melodies. Using this and other techniques we set out to create a new performance piece, meant to give delight and pleasure, guided every step of the way by Jean Bretel’s narrative, so generous and detailed in its descriptions of the festive music and dance at Chauvency c. 1310. We cannot, of course, re-create with total precision the music of 1310. Even as we proceed with as much care and respect for our sources as possible, using Douce 308 and related manuscripts of the period, we hope to avoid the pitfalls of pseudohistoricism. Many decisions about performance style and manner must of necessity be supplied by the performers and by the artistic director; we embrace the large responsibility of making such decisions with humility, but also with enthusiasm and joy. What we present is a work for our time, drawing on the incredible life force that emerges from the manuscript’s folios, redirecting this magnificent force, to the best of our abilities, into our own ears, minds, and hearts. These performances are dedicated to the memory of Tom Zajac, a member of the original, 2007 European production of this show. His marvelous spirit is very much present in the work we present to you today. Born in France, Azéma has lived in Boston for many years and became a citizen of the United States in 2004. Well known to Boston audiences for her many years as soloist with Boston Camerata (of which she became Artistic Director in 2008), she also is a distinguished scholar and researcher, leading her own musical teams on a series of original programs (concerts and recordings) of Medieval music. Among other rewards she is a co-recipient of the Grand Prix du Disque.